On 3-Jul-2013, the loss-making Alitalia Group announced its new industrial plan for 2013-2016. It includes refocusing the different roles of Alitalia and Air One, growing intercontinental activities, developing infrastructure partnerships and extracting more value from the group’s frequent flyer programme. Possibly the most significant outcome is that it should buy time for the Group’s new CEO Gabriele Del Torchio, appointed in Apr-2013. Seeking cash from an increase in a convertible loan from shareholders and from other sources before the end of 2013, it holds out the promise of a return to a positive net result in 2016. In Part 1 of our report on the Alitalia Group’s new plan, we assess its strategic decision to redefine the roles of Alitalia and Air One and to develop its intercontinental activities. In Part 2, we will look at its strategies around collaboration with infrastructure partners and analyse is financial targets. Alitalia’s plan for 2013 to 2016 identifies four strategies based on the three principal businesses. These are Alitalia, its subsidiary Air One and Alitalia Loyalty, which was formed at the end of 2012 to develop the MilleMiglia FFP. The four strategies relate to the redefinition of the roles of Alitalia and Air One with regard to short and medium-haul routes; the development of intercontinental activities; the development of infrastructural partnerships and more attention to intermodal transport; and new opportunities from Alitalia Loyalty. The plan also envisages the re-hubbing of Rome Fiumicino to reorganise and optimise flight arrival and departure schedules. In terms of financial targets, Alitalia aims to achieve a positive EBIT in 2H2013, a break-even operating margin in 2014, a “balanced budget” (presumably break-even at the net profit level) in 2015, and a “balance sheet profit” (presumably a positive net profit) in 2016. In addition, it plans to increase the convertible loan from shareholders by EUR55 million and to increase financial resources by EUR300 million by Dec-2013 (presumably through increased debt or asset disposals). Alitalia says that the aviation market “has seen a sharp reduction in the domestic traffic sector, against a growth of international and intercontinental routes, particularly to Eastern Europe, North and South America, Middle and Far East”. The plan aims to grow revenues from overseas activities, which currently account for 50% of Group revenues. Air One is currently a predominantly domestic carrier, with significant capacity at Alitalia’s two Milan hubs and Rome Fiumicino. 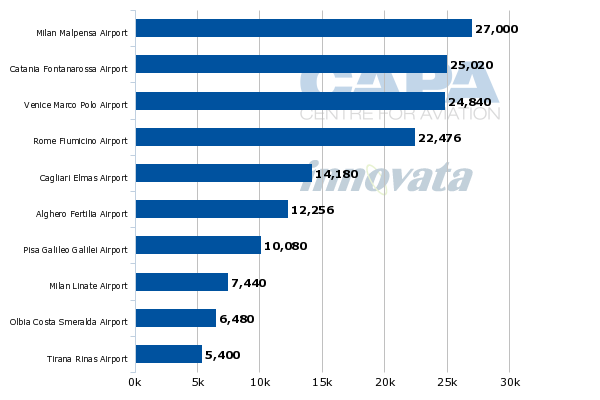 Catania, Venice and Pisa are currently among its top 10 bases by seat capacity, but Palermo is not. Presumably, Air One’s capacity at Palermo will grow (it currently only flies to Milan Linate and Venice from Palermo), while its capacity in Milan and Rome will reduce since the latter two will be the focus for Alitalia itself. Alitalia says that the increase in capacity in Sicily “responds to the need to meet the high traffic demand”, while planned growth in Venice is in order “to regain market share in North East Italy”. It also regards a presence in Pisa as “of great importance”. In Sicily, the group currently has a fairly strong position at Catania. Alitalia itself currently has around twice Air One’s seat capacity at the airport, reflecting the importance of Rome, Milan Linate and Milan Malpensa as the top three domestic routes from the airport. Between them, the two airlines have a combined 41% share of seats at Catania, which is also served by competitors such as Meridian fly, easyJet and Ryanair. 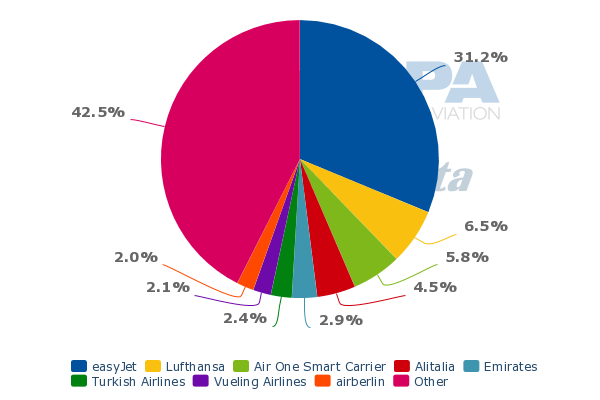 At Palermo, Air One currently only has a 4% share of seats, but Alitalia is the leading carrier with 27%. Ryanair is second with 22% and easyJet third with 11%. 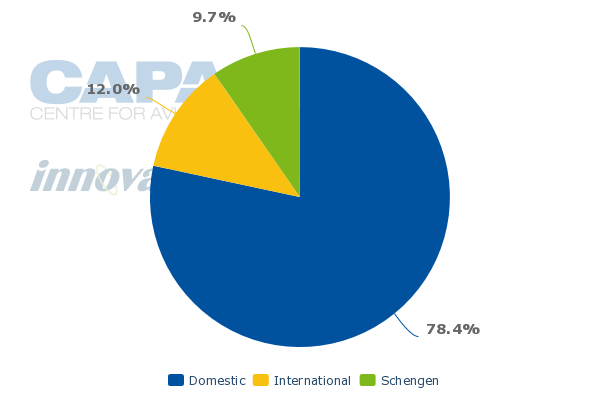 The majority (77%) of seat capacity at Palermo is domestic and the biggest domestic destinations are Rome and Milan, where Alitalia is relatively strong. International routes are dominated by foreign competitors. If Air One and Alitalia give the group a relatively strong base in Sicily, it may have more of a struggle in Venice and Pisa. 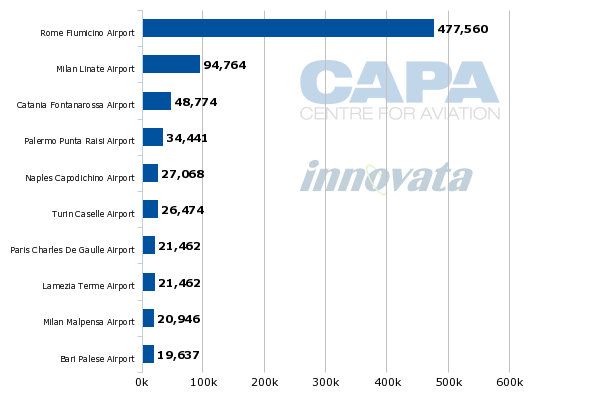 Air One has 8% of the combined seat capacity of the two Venice airports and Alitalia has 4% of this market. Ryanair and easyJet have 15% and 11% respectively. At Pisa, where three quarters of seat capacity is international, Air One and Alitalia are currently the number three and number five carriers respectively, with a combined share of 10%. Ryanair is the dominant player, with 62% of seats, and easyJet has a share of 9%. LCCs are also represented by Jet2.com, Norwegian Air Shuttle and Transavia.com. For Alitalia itself, the biggest bases are Rome Fiumicino and Milan Linate. According to the new plan, Alitalia will operate all national and international connections to/from Rome Fiumicino and to/from the two Milan airports. This implies that Air One routes to and from these airports will be transferred to Alitalia. Alitalia aims to grow international and intercontinental services at the three hubs. In support of this aim, it also plans to use some of its slots at Milan Linate that are currently allocated to the Rome route on international point-to-point routes. This follows its loss of a monopoly on the Linate-Fiumicino route after easyJet commenced operating the route in Mar-2013. New routes planned from Linate include Copenhagen, Budapest, Vienna, Stockholm, Helsinki, Malta, Tallinn, Prague and Warsaw. Milan Malpensa will continue to serve non-EU destinations such as Cairo, Tunis, Moscow and Tirana. New routes from Rome Fiumicino are being considered, including Nuremberg, Lviv, Bordeaux, Skopje, Zagreb, Sarajevo, Ankara, Marrakech, Misurata, Minsk, Basel, Marseille, Rostov, Pristina, Damascus and Erbil. Alitalia is the leading airline at Rome Fiumicino, with 47% of seats (49% for the group, including Air One). LCC easyJet is number two, with a share of almost 7%, and the LCC threat is further highlighted by the presence of Vueling. The biggest routes from Fiumicino are domestic: Milan Linate, Catania and Palermo. Paris CDG is the number four route, and the biggest international route by seats, reflecting the importance of connections to the hub of SkyTeam partner Air France. At its Milan Linate base, Alitalia has a seat capacity share of 36%, rising to 44% with Alitalia Express, and LCCs are largely excluded from the airport (although easyJet now has almost 4% of seats). 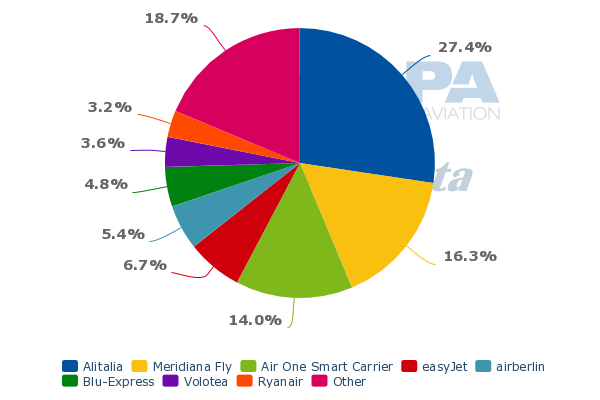 However, LCCs have a strong share at Milan Malpensa (easyJet is number one with 31% of seats) and the Alitalia Group’s share of seat capacity is just 10%. The wider Milan airport system also includes the airport of Bergamo, now known as Milan Bergamo. Ryanair’s seat capacity here is larger than that of the Alitalia Group at the other two Milan airports combined. The Alitalia Group is the number two player in Milan’s three airport system, with well under 20% of seats, and it faces formidable competition from both Ryanair and easyJet. Alitalia’s plan notes the growth in international routes and the decline in the domestic sector and aims to grow the group’s revenues from international routes. The Group is only the number two player in overall international seats to/from Italy, with a 12% share. 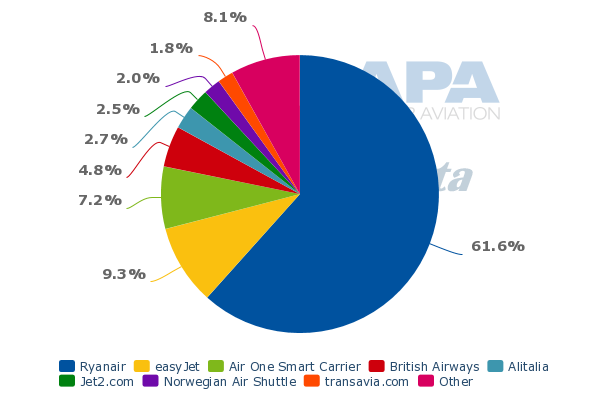 Ryanair is number one with 19% and the top five also includes easyJet and rival flag carrier groups Lufthansa and IAG. 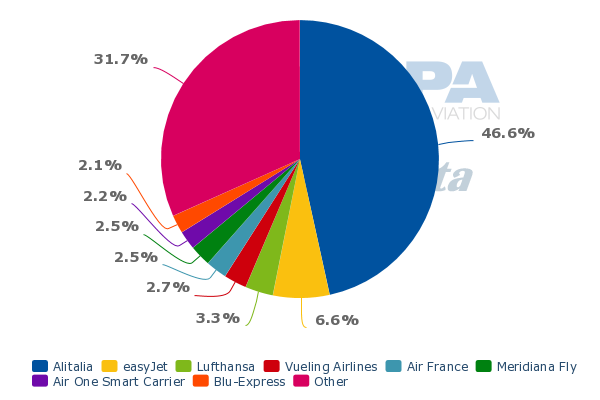 Air France-KLM, which owns 25% of Alitalia and is a fellow SkyTeam member, is the lowest ranked of the major airline groups on international seats to/from Italy. This highlights both the importance of attempting to improve Alitalia’s international position and also the challenge of achieving this aim. Looking at international seats from Italy by destination region, the Alitalia Group is the leader on direct routes from Italy to Asia-Pacific, Latin America and Africa and it is number two to the Middle East, but these are small markets. It is also number one on the slightly larger market to North America. Intercontinental routes are the subject of the second of Alitalia’s four strategies (see below). On the much larger market of international seats between Italy and Europe, which accounts for more than two thirds of Alitalia’s international seat capacity, it ranks only fourth (behind Ryanair, Lufthansa Group and easyJet). 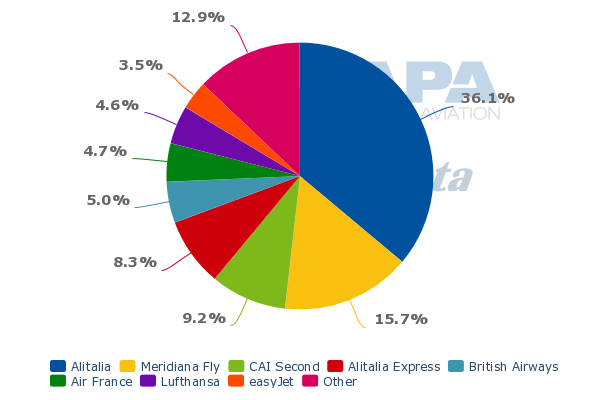 All of Alitalia’s nine planned new international routes from Milan Linate have existing competitors; seven of them have more than one competitor. There are LCC competitors on eight of these routes and more than one LCC on five of them. Alitalia’s previous experience of competing with LCCs has generally not been positive. The competitive situation on the possible new routes that Alitalia is considering from Rome Fiumicino is less fierce than it is on the planned new Milan routes. Out of the 15 possible routes identified by Alitalia, there is currently no competitor on seven and only one competitor on six. LCCs operate on only five of these routes. Alitalia says that it will be rethinking its pricing strategies “to take into account and to attract not only those who choose a premium fare (the vast majority of Alitalia passengers today), but also price-sensitive customers”. It has not given further details of what it proposes, but this suggests that it will adopt lower entry fares with a simplified, unbundled offer. This is borne out by Alitalia noting that passengers “will be able to customise their travel experience by choosing additional services”. Given the breadth and depth of LCC competition Alitalia faces, and has faced for some years, this seems an overdue move. Nevertheless, Alitalia still has a much higher cost base than the LCCs and will have to hope that passengers will, indeed, choose additional services over low fares. Alitalia’s 2013-2016 plan calls for a “strong projection on the intercontinental network”. This includes developing the long-haul fleet, adding new long-haul routes and strengthening commercial partnerships with other carriers. According to the CAPA Fleet Database, the Alitalia Group fleet currently consists of 144 aircraft, of which 22 are widebodies, 101 are narrowbodies and 21 are regional aircraft. Between 2013 and 2015, it currently expects delivery from manufacturers of five Embraer regional aircraft and two A320 narrowbodies. With regard to long-haul aircraft, it currently has 12 Airbus A350s on order, with expected delivery dates between 2020 and 2022 (source: CAPA Fleet Database). The new plan envisages the introduction of six long-haul aircraft during 2013-2016, although no further details have been given in terms of aircraft types, delivery dates or how these aircraft will be funded. In addition, 10 Airbus A330 aircraft will be reconfigured from Oct-2013 into 2014. Again, no further details have been given, other than that the reconfiguration is the result of research into “the precise needs of the Italian air transport market”. Alitalia is planning new long-haul routes with “high traffic potential” from Rome Fiumicino, Milan Malpensa and Venice. It says that new routes which may be introduced between Winter 2014 and Winter 2016 are to Nairobi, Seoul, Santiago de Chile, San Francisco and Johannesburg; Milan Malpensa to Shanghai, Abu Dhabi and Osaka; and Venice to Tokyo. There are currently no direct competitors on six of these nine routes. The plan also refers to the “strengthening of the Alitalia presence through increased frequencies to North and South America (especially the United States and Brazil), Japan and the Arabian peninsula”. These markets from Italy are currently fairly small in terms of seat capacity, but the Alitalia Group is number one or two in all of them and this should provide a base for further growth. As noted above, it is the leader on direct routes from Italy to North America (but it is number two to the US, just behind SkyTeam partner Delta), Latin America (including Brazil), Asia-Pacific (including Japan) and Africa and number two to the Middle East. Although it has leading positions on intercontinental markets from Italy, the fact remains that Italy is not very well served by direct intercontinental routes. The Alitalia Group has a lower percentage of its total seats on intercontinental routes than any of Europe’s Big Three legacy flag carrier groups (and it is smaller overall). This leads it to depend on partnerships with other carriers, in particular Air France-KLM and other SkyTeam members in order to offer its passengers access to under-served countries. Alitalia’s plan aims to reinforce existing codeshare agreements and to develop new agreements, although it has not yet announced anything specific. In order to facilitate elements of the 2013-2016 plan contained in the first two strategies, Alitalia has announced a project to “re-hub” its operations at Rome Fiumicino. This will be launched in Oct-2013 in time for the winter schedule. The change of time slots for flights to/from Fiumicino is aimed both at business passengers on continental routes, with early morning departures and evening returns for European destinations, and at passengers originating from other Italian airports and connecting via Rome to long-haul destinations. Alitalia also hopes to achieve cost efficiencies as a result of this project. The first two strategies of Alitalia’s 2013-2016 plan, outlined and analysed above, give some additional clarity over the different roles of Air One and Alitalia. Air One will focus on point-to-point routes from Italian regions – specifically Sicily, Tuscany and the northeast – while Alitalia will focus on the hubs at Rome Fiumicino and the two Milan Airports. The group will add international routes and, on a number of European destinations, it will increase its level of competition with LCCs. New pricing strategies may possibly increase the number of low fares with Alitalia, but will not fundamentally address the problem that it has a higher cost base than these competitors. On long-haul destinations, its possible new routes will face less competition, but expansion of its intercontinental network will still leave Alitalia’s operations looking sub-scale in this segment. Moreover, the addition of six long-haul aircraft raises questions about how these assets will be funded. In Part 2 of our report, we will consider the plan’s other two strategies: infrastructure partnerships and the development of the FFP, and Alitalia’s financial targets.